The Flood Girls by Richard Fifield is an engaging story of regrets and redemption set in small-town America. After almost a decade’s absence, Rachel Flood is back in Quinn, Montana (Population:956) to make amends for the devastation she wrought as a wild teen to an openly hostile collection of family, (ex) friends and enemies. After a week of scathing silence, pointed glares and outright threats, Rachel is on the verge of admitting defeat when her mother, Laverna Flood, the proprietor of one of Quinn’s two taverns ‘The Dirty Shame’, is targeted in a robbery and her injuries require Rachel to take her mother’s place behind the bar, and on the local women’s softball team. This is a story full of family dysfunction, addiction, friendship, failure and forgiveness. Rachel’s search for redemption is complicated, and no-one is inclined to make it easy on her, least of all her self. Fifield has created an eccentric and often outlandish cast, including the uncompromising Laverna, the frightening Red and Black Mabel’s (distinguished by a rotten smile), Rachel’s no nonsense sponsor, Athena, and the members of the softball team. The town’s three rookie firefighter volunteers are all named Jim, the Police Chief runs the local AA meetings, and Reverend Foote is determined to convert the town’s sinners. Of all the characters however is Rachel’s neighbour, twelve year old Jake, who is the most endearing. A devotee of Madonna and Jackie Collins, with an individual sense of style and fashion, he is mature beyond his years, but his effeminate manner infuriates his brutal stepfather. Jake is one of the few residents of Quinn willing to give Rachel a chance, and a delightful bond develops between them. 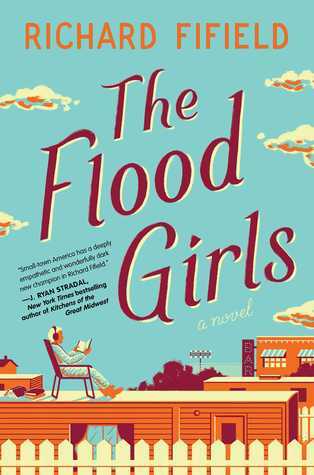 Though the humour is a little uneven and the plot not particularly original, The Flood Girls is written with heart and a genuine feel for small town life. A strong debut. Previous Review: Honky Tonk Samurai by Joe R Lansdale Next Brooklyn winners!